Background: Smokeless tobacco (ST), locally called shammah, is a form of tobacco that is widely used in Middle Eastern countries, including Saudi Arabia. Objective: A total of 21 ST samples were collected from the southern province of Jazan for elemental analysis. Materials and Methods: These samples were analyzed by inductively coupled plasma mass spectrometry to determine their element concentrations. Chemometric multivariate analysis such as hierarchical cluster analysis, Pearson correlation analysis, and principal component analysis were performed for better understanding and interpretation of the data. Concentrations obtained were used to determine the users' daily and weekly intake of elements and were compared with the acceptable daily intake and provisional tolerable weekly intake. Results: Metal ions present in maximum concentrations were strontium (11608.71 μg/kg) and manganese (3543.10 μg/kg), whereas those with minimum concentrations were silver (53.90 μg/kg) and chromium (62.33 μg/kg). Conclusion: Although the concentrations of all the elements fell under the safe limit, the concentrations of many toxic elements were significantly high and resulted in various health hazards on the intake of these elements with other sources. Abbreviations used: ST: Smokeless tobacco; EDI: Estimated daily intake; ADI: Acceptable daily intake; PTWI: Provisional tolerable weekly intake; HQ: Hazard Quotient; RfD = Oral reference dose; ICH: International Council for Harmonisation; ICP-MS: Inductively coupled plasma-mass spectroscopy; AAS: Atomic absorption spectroscopy; CTA-OTL-1: Oriental Tobacco Leaves; % R. S. D.: % Relative standard deviation; ppb: Parts per billion; LOD: Limit of detection; SD: Standard Deviation; FAO: Food agriculture organization; WHO: World Health Organization; JECFA: Joint Expert Committee on Food Additives. Various Chemometric statistical analyses were performed to analyze the correlation between elements present in samples. Smokeless tobacco (ST), also known as chewing, spitting, dipping, or snuffing tobacco, is a form of tobacco that is used other than smoking. ST is generally used by placing tobacco into the oral cavity, mostly between the lips or cheeks and gums, and ingesting the saliva produced thereafter. The general types of ST include the leaves of Nicotiana tabacum, Nicotiana rustica, Nicotiana glauca, or Nicrophorus nepalensis., Although, the trade of ST is illegal in some countries such as Saudi Arabia, Japan, Hong Kong, Singapore, Australia, and New Zealand, its use is continuously increasing with time. ST has over 300 million users worldwide, and most of these users are from South Asian and Middle Eastern countries. The use of ST is more prevalent in the southern part of Saudi Arabia (Jazan Province) due to its proximity to Yemen, where it is legal to use and trade. ST is associated with a range of adverse health issues, including cancer and cardiovascular diseases. Some harmful substances are reported to be found in ST, including at least 28 chemicals as potential carcinogens, of which nitrosamines are the most harmful. There are some trace elements in the soil that are absorbed by tobacco plant which accumulates them in its leaves in large quantities. Some of the elements are too toxic to the human body even in minute quantities.,,, The concentrations of these trace elements in tobacco largely depend on the genotype; type and pH of water and soil; fertilizers and pesticides used; and various other environmental factors. Some of these elements are responsible for different types of ailments and diseases when consumed in quantities beyond the tolerable limits. The regions of Jazan Province, where the use of ST (Shammah) was most prevalent, were selected for sample collection. These regions were Jazan, Sabya, Abu Areesh, Ahd Al Masaraha, and Samtah. Different types of tobacco samples collected were Green, Black Adani 1, Black Adani 2, Black Sudani, Suhail, Areeshi, and Special. A total of 21 different types of samples were collected and subsequently analyzed to investigate their metal ion concentrations using inductively coupled plasma mass spectrometry (ICP-MS). Different types of metal ions analyzed in this study were lithium (Li), beryllium (Be), vanadium (V), chromium (Cr), manganese (Mn), cobalt (Co), copper (Cu), zinc (Zn), gallium (Ga), arsenic (As), selenium (Se), rubidium (Ru), strontium (Sr), silver (Ag), cadmium (Cd), cesium (Cs), barium (Ba), thallium (Tl), lead (Pb), and uranium (U). ICP-MS was used to determine the metal ion concentrations in tobacco samples because it is a robust, sensitive, and accurate method having high detection capability and can be used to accurately detect concentrations at parts per quadrillion level. Moreover, the advantage of ICP-MS over other elemental detection techniques, such as atomic absorption spectroscopy (AAS), is that the concentration of a single element can be measured in AAS at a specific time, whereas, all elements can be determined simultaneously in ICP-MS. 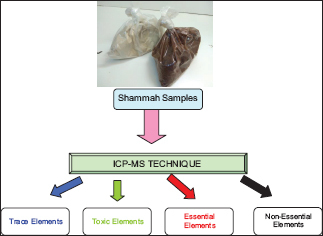 The present study was aimed to select various tobacco samples from different regions of Jazan Province and to determine the metal ion concentrations in their leaves by using ICP-MS and their comparison with the provisional tolerable weekly intake (PTWI) to assess the health hazards that they pose. A total of 21 samples were collected from five different cities of Jazan Province: Khudra Jazan (Jazan Green; Sample no. T-1), Areeshi Jazan (Sample no. T-2), Adani Jazan (Jazan Black Adani type-1; Sample no. T-3), Adani Jeeban (Jazan Black Adani type-2; Sample no. T-4), Sudani Sabya (Sabya Black Sudani; Sample no. T-5), Suhail Sabya (Sample no. T-6), Khudra Sabya (Sabya Green; Sample no. T-7), Areeshi Sabya (Sample no. T-8), Khususi Masna Sabya (Sabya Special; Sample no. T-9), Adani Barid Abu Areesh (Abu Areesh Black Cool type; Sample no. T-10), Adani Haar Abu Areesh (Abu Areesh Black Hot type; Sample no. T-11), Khususi Abu Areesh (Abu Areesh Special; Sample no. T-12), Areeshi Abu Areesh (Sample no. T-13), Ahd Al Masaraha Areeshi (Sample no. T-14), Ahd Al Masaraha Khudra (Ahd Al Masaraha Green; Sample no. T-15), Ahd Al Masaraha Khususi (Ahd Al Masaraha Special; Sample no. T-16), Adani Baheel Ahd Al Masaraha (Ahd Al Masaraha Black Adani with Cardamom, Sample no. T-17), Adani Ahd Al Masaraha (Ahd Al Masaraha Black Adani; Sample no. T-18), Khudra Abu Areesh (Abu Areesh Green; Sample no. T-19), Areeshi Khudra Samtah (Samtah Green Areeshi; Sample no. T-20), and Khususi Samtah (Samtah Special; Sample no. T-21). The five cities of Jazan Province, from which the samples were collected, included Sabya, Abu Areesh, Ahd Al Masarha, and Samtah. The use of ST is most prevalent in these cities. The samples were collected and stored in dry condition away from direct sunlight until further analysis. All the chemicals used were of AR grade and were purchased from Sigma Aldrich (Germany). Deionized water (18 MΩ) purchased from Sigma Aldrich (Germany) was used throughout the study. Microwave Digestion System Ethos I (Milestone, USA) was used for the digestion of tobacco samples. The elemental concentrations of the digested samples were analyzed using ICP-MS 7500 (Agilent, Germany). To determine the total concentration of different metals, 0.1 g of dry and fine ST samples were taken and digested in a microwave digestion system ethos I in Teflon vessels with 4 mL of nitric acid. The digestion parameters were as follows: The programmable microwave power ranged from 800 W to 1400 W, temperatures ranged from 50°C to 200°C, ramp time was set to 10 min, and the total time of digestion was 70 min. On completion of the digestion process, Teflon vessels were allowed to cool at room temperature for 30 min. Thereafter, the Teflon vessels were opened under the hood and kept for 5 min until all fumes evaporated. The digested samples (0.5 mL) were then diluted to 10 mL with ultrapure deionized water and analyzed using the ICP-MS. Blanks were digested and prepared by following the same procedure. The metal concentrations of the ST were analyzed using ICP-MS 7500 (Agilent, Germany). All samples, blanks, and standards were analyzed in triplicate. Instrument quality control and tuning were performed using an instrument tuning solution at 1 ppb in 2% HNO3. Cw= amount of Tobacco consumed per week = 35 g.
bw = average body weight (kg) of target population = 70 kg. RfD = reference dose of the substance. The analytical data were analyzed using SPSS statistical program 20.0 (IBM, SPSS, Armonk, NY). Three multivariate statistical analyses were employed for better interpretation of data. There were 20 rows expressing various elements and 21 columns indicated different ST samples. Hierarchical cluster analysis was performed to determine if there were any significant groups of samples with the same characteristics. Pearson correlation analysis was utilized to show the correlation between variables and is useful in determining divergence and coherence of data. The third multivariate technique performed was a principal component analysis on the whole data to check the variability on a scale by dividing variables into principal components. All the method validation parameters were assessed according to the ICH guidelines (Q2R1), and the results are presented in [Table 1]. Multi-element calibration curve was constructed for the quantification of elements and excellent linearity (1> r > 0.99) was observed for all elements. 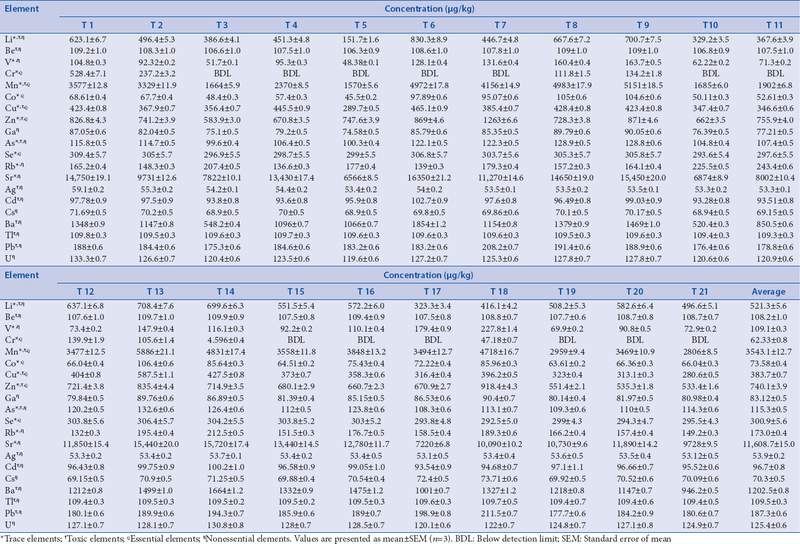 % Recovery, % Accuracy, % R. S. D. and LOD values were calculated for each element, and the results are summarized in [Table 2]. % Recovery values were obtained to be in a range of 92%–105%, % Accuracy was obtained in a range of 96%–122% and % R. S. D. values were <2.0 in case of all elements. All the obtained values were within the prescribed limit as stated in the ICH guidelines. All 20 elements were analyzed simultaneously for each sample in triplicate, and the concentrations were determined in micrograms per kilograms (μg/kg). 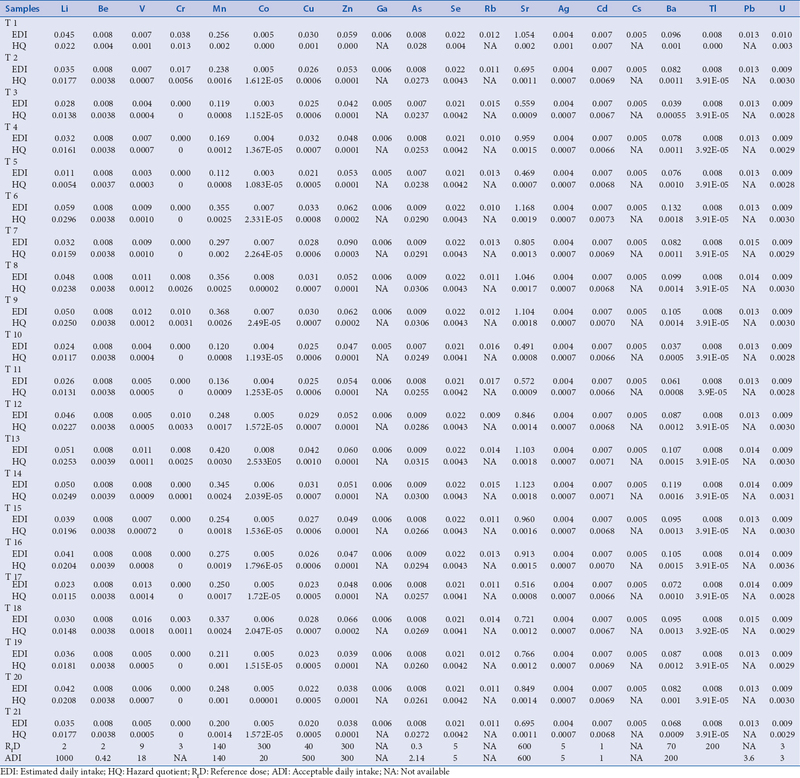 All the obtained results are summarized in [Table 2]. The highest concentration was found for Sr (average concentration = 11608.71 μg/kg), whereas the lowest concentration was for Cr (average concentration = 62.33 μg/kg) in all the samples. 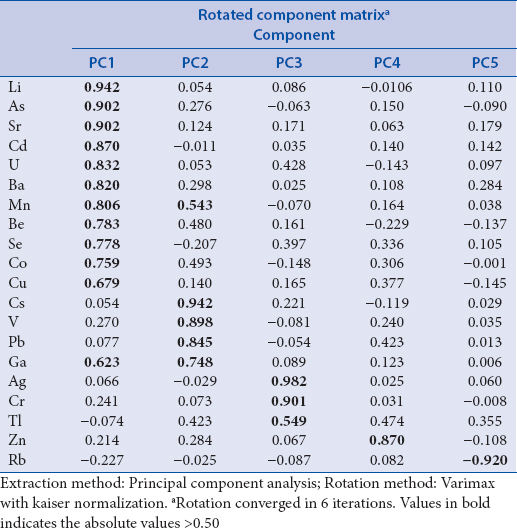 The concentration values of all the elements in different samples were almost similar with few exceptions. For example, Cr was present in sample T-1 in relatively high quantity (528.4 μg/kg), but it was below detection limit (BDL) in most samples. Li was present in the concentration range of 151.7–708.4 μg/kg with an average of 521.28 μg/kg. Similarly, Be (106.3–109.9; 108.2), V (48.38–227.8; 109.08), Cr (0–528.4; 62.33), Mn (1570–5886; 3543.1), Co (45.5–106.4; 73.58), Cu (280.6–587.5; 383.75), Zn (533.4–1263; 740.07), Ga (74.58–90.41; 83.12), As (99.6–132.6; 115.29), Se (292.5–309.4; 300.86), Rb (132–225.5; 172.94), Sr (6566–16350; 11608.71), Ag (53.15–59.13; 53.90), Cd (93.28–102.7; 96.7), Cs (68.9–73.71; 70.29), Ba (520.4–1854; 1202.54), Tl (109.3–109.8; 109.53), Pb (175.3–211.5; 187.36), and U (119.6–133.3; 125.45) were found to be in significant quantities in all the samples. 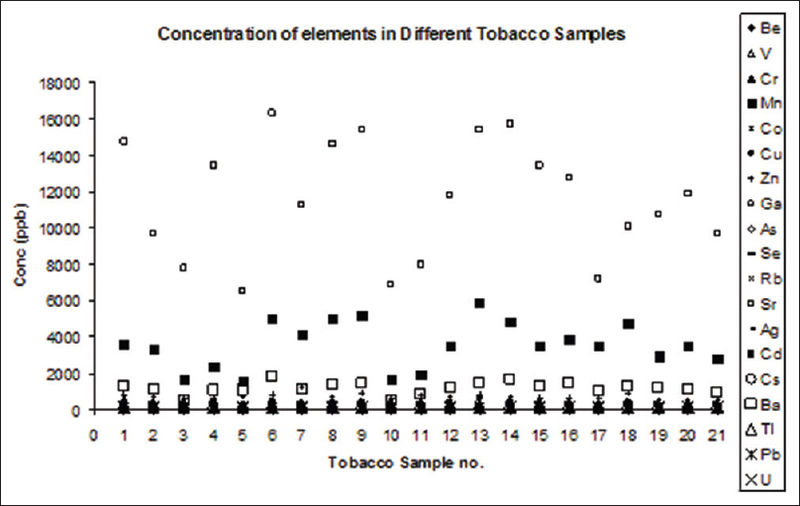 [Figure 1] shows the comprehensive chart of various elements present in different tobacco samples for comparison. The amounts of elements consumed per week [Table 3] by the user were calculated using Equation 1, and the resulting values were compared with the PTWI based on the guidelines set by the Food Agriculture Organization/World Health Organization and Joint Expert Committee on Food Additives (JECFA). The PTWI for some elements, such as Li, V, Cr, Mn, Co, Cu, Zn, As, Se, Cd, and Pb were set to be 600, 500, 200, 4000, 19, 1500, 15, 35, 7, and 25 μg/kg body weight, respectively.,, Therefore, for these elements, the tolerable limits per week for a 70 kg person would be 42, 35, 14, 280, 1.33, 245, 105, 1.05, 2.45, 0.49, and 1.75 mg for Li, V, Cr, Mn, Co, Cu, Zn, As, Se, Cd, and Pb from all sources, respectively. These limits were compared with the consumption of elements per week using ST, and the results showed a significant share in the total dietary intake for tobacco users. The results for the estimated consumption of elements per week are summarized in [Table 3]. It shows the amounts of elements found in 35 g sample, which is the approximate weekly intake of tobacco by the user for each sample. Although all the results were under the PTWI, they are still alarming because they constitute a major part of the total dietary intake of these elements by all means. These elements are also present in other food sources, and together, they can cross the PTWI, which could be detrimental for the user. The results for EDI and HQ are summarized in [Table 4]. The EDI for each element was calculated for different tobacco samples which gives the concentration of various elements consumed daily by the user per kg body weight. This result can be compared with acceptable daily intake (ADI) and PTWI, which were previously established along with RfD by JECFA and the United States Environmental Protection Agency (U. S. EPA). The HQ values of various elements were calculated by dividing the EDI with Oral RfD is the dose in μg that can be taken orally per kilogram body weight per day. If the HQ of an element is more than one, that is, if the EDI exceeds RfD, then the element is considered toxic. Similarly, if the HQ is <1, that is, the ADI is less than the RfD, then the element is not considered hazardous. All the HQ values were <1, indicating that the overall intake of elements from ST was within safe limits. By performing the cluster analysis, for the elements, we could determine that there were four clusters of samples based the clustering method used. The cluster solution was seen as a sudden jump (gap) in the distance coefficient. The solution before the gap indicates the good solution. Samples T-2,-7,-12,-18,-19,-20, and -21 were distributed in the same cluster. Where sample T-3,-5,-10,-11, and -17 have the same characteristics to be include in the same cluster. 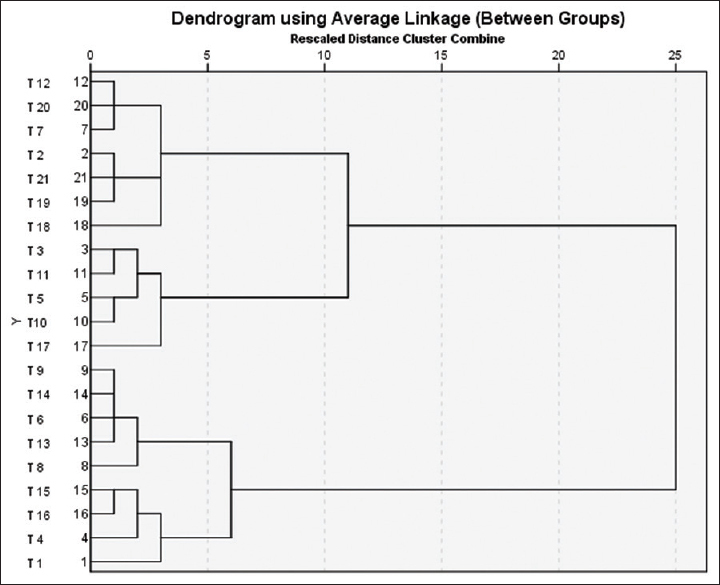 Distribution of the samples based on their elemental concentrations in form of a dendrogram is shown in [Figure 2]. For correlation analysis, values obtained that were higher than 0.50 were considered to correlate various data points and the results are summarized in [Table 5]. Values in bold indicated significant correlation between variables at higher confidence interval (**P < 0.01). If the values obtained were positive, it showed positive correlation among the variables, whereas, the negative values signified negative correlation. The correlation values near to “zero” indicated poor and nonsignificant positive or negative correlation and on the other hand, values closer to “one” indicated significant correlation among variables. Interestingly, no any pair of elements displayed significant negative correlation among themselves at both the confidence levels (P = 0.01 and P = 0.05). Rubidium (Rb) showed an interesting behavior by not showing any significant positive or negative correlation with any of the element. Another element, Zinc (Zn), showed positive significant correlation with only one element (Co). Therefore, these two elements were placed in two distinct groups. The remaining elements were placed in three different groups following the interpretation of the correlation matrix. Group I consisted of elements such as Li, As, Sr, Cd, U, Ba, Mn, Be, Se, Co, and Cu. Group II comprised Cs, V, Pb, and Ga whereas, elements such as Ag, Cr, and Tl were placed in group III. Group IV and Group V consisted of Zn and Pb, respectively. This grouping of elements was further analyzed through another multivariate analysis, i.e., principal component analysis. Principal component analysis was performed on the whole data and the results obtained are summarized in [Table 6]. It shows the rotated component matrix of the principal component analysis. All the variables are grouped in five principal components (PC1 to PC5). Data in bold showed the absolute values >0.50. Elements of Group I were found to give major contribution to principal component 1. Similarly, Group II elements of the correlation matrix were the major contributor to principal component II. 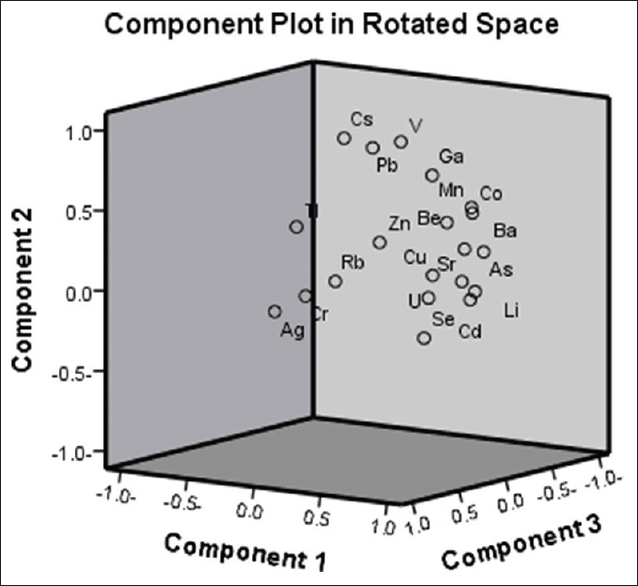 Three major principal components were observed as shown in [Figure 3] that depicts the component plot in rotated 3D-space. It shows the exact placement of elements in their principal components according to their absolute values. All the detected elements were classified into (a) trace, (b) toxic, (c) essential, and (d) nonessential elements based on their nature and abundance and their presence in tobacco samples were studied. Various trace elements present were Li, Zn, Cu, Cr, Co, V, As, Rb, Sr, Mn, and Se, whereas toxic elements such as As, Pb, Cd, Be, Cu, Li, Mn, Ag, Zn, Ba, and Tl were also present. These elements are considered to be toxic when consumed even in smaller quantities for a long period. Arsenic (As) is known to cause cancer and diabetes, whereas, Pb is responsible for anemia, plambism, and encephalopathy. Cadmium (Cd) causes high blood pressure, lung cancer, and osteomalacia, whereas, Be leads to cardiovascular disorders. Similarly, other elements have various harmful effects on the body when consumed regularly. Essential elements that were present in the tobacco samples were Co, Cu, Cr, Mn, Se, and Zn. These elements were present in trace quantities in all the samples. Furthermore, the presence of nonessential elements was also observed. These elements were V, As, Ba, Be, Cd, Ga, Ag, Pb, Li, Rb, Sr, Cs, Tl, and U which were present in low-to-high concentrations. The presence of heavy metal ions in tobacco samples was also investigated, and their concentrations were compared with the prescribed limits. The heavy metals present in these tobacco samples were As, Cu, Cr, Co, Zn, Ag, Cd, Pb, Se, and Tl. Although, except Zn, the presence of other heavy metal ions was comparatively less but cannot be ignored. Heavy metals in biological systems are known to have pronounced effects on cellular components and various enzymes involved in metabolism and repair. They interact with the cellular components and cause conformational changes that damage these components and lead to cancer and apoptosis., Heavy metals, such as As,,, Cd, Cr,, and Pb,, are known to produce carcinogenic effects due to their capability to produce ROS in biological systems. These elements are among those that pose a significant hazard to human health. These elements are all systemically toxic and cause damage to many organs, even at low concentrations. Various experimental and epidemiological studies have reported that these elements are placed under the category “known” carcinogens by the U. S. EPA and the International Agency for Research on Cancer. The concentrations of various elements in all 21 tobacco samples were measured successfully by ICP-MS. The tobacco samples were of different varieties, color, and origin, and most of the elements in these samples showed some variation in concentration. Elements were found in either significantly high or relatively low concentrations. Different types of heavy and toxic metals, which could lead to various health hazards like cancer and cardiovascular diseases, were found in all tobacco samples. Further studies should be conducted to discover other toxic substances that are present in these tobacco samples to justify their potential in causing diseases. The authors are thankful to the Deanship of Scientific Research, Jazan University for providing financial assistance (Research Group no. RG-2-9) to carry out this research work. This work is supported by Deanship of Scientific Research, Jazan University, Jazan, Saudi Arabia as Group Research Project (no. RG-2-9). Winter JC. Tobacco Use by Native North Americans: Sacred Smoke and Silent Killer. Chicago: University of Oklahoma Press; 2000. Valdes de la Cruz M, Gonzalez C, Lara RM, Roman MI, Hernandez Y, Hernandez RM, et al. Genetic diversity of wild species of Nicotiana genus I: Characterization using biochemical markers. Rev Prot Veg 2010;25:88-97. Klus H, Kunze M, Konig S, Poschl E. Smokeless tobaccoan overview. Beitr Tabak Contr Tob Res 2009;23:125-8. National Cancer Institute and Centers for Disease Control and Prevention. Smokeless Tobacco and Public Health: A Global Perspective. Bethesda, MD: US Department of Health and Human Services, Centers for Disease Control and Prevention and National Institutes of Health, National Cancer Institute; 2014.
International Agency for Research on Cancer. Smokeless Tobacco and Some Tobacco-Specific N-Nitrosamines. Vol. 89. Lyon, France: World Health Organization International Agency for Research on Cancer, International Agency for Research on Cancer Monographs on the Evaluation of Carcinogenic Risks to Humans; 2007. Repace JL, Lowrey AH. Indoor air pollution, tobacco smoke, and public health. Science 1980;208:464-72. Wu D, Landsberger S, Larson SM. Determination of the elemental distribution in cigarette components and smoke by instrumental neutron activation analysis. J Radioanal Nucl Chem 1997;217:77-82. Smith MV, Sneddon J. Simultaneous determination of cadmium and lead in cigarettes and cigarette smoke by impaction-graphite furnace and graphite furnace atomic absorption spectrometry. Spectrosc Lett 1999;32:615-21. Csalari J, Szantai K. Transfer rate of cadmium, lead, zinc and iron from the tobacco-cut of the most popular Hungarian cigarette brands to the combustion products. Acta Aliment 2002;31:279-88. Food and Agriculture Organization/World Health Organization, Joint Expert Committee on Food Additives. Evaluation of Certain Food Additives and Contaminants. Vol. 837. Geneva: World Health Organization Technical Report series, World Health Organization; 1993. Food and Agriculture Organization/World Health Organization, Joint Expert Committee on Food Additives. Evaluation of Certain Food Additives and Contaminants. Vol. 940. Geneva: World Health Organization Technical Report Series, World Health Organization; 2007. Food and Agriculture Organization/World Health Organization, Joint Expert Committee on Food Additives. Summary report of the Seventy-Second Meeting of Joint Expert Committee on Food Additives. Geneva: World Health Organization; 2010. Joint Food and Agriculture Organization/World Health Organization Expert Committee on Food Additives. Summary and Conclusions of the 61st Meeting of the Joint Food and Agriculture Organization/World Health Organization Expert Committee on Food Additives. Rome, Italy: Proceedings of JECFA/61/SC; 2003. p. 1-22. United States Environmental Protection Agency. Risk-Based Concentration Table. Philadelphia, USA: United States Environmental Protection Agency; 2011. World Health Organization/Food and Agriculture Organization/International Atomic Energy Agency. Trace Elements in Human Nutrition and Health. Switzerland, Geneva: World Health Organization; 1996. Stern BR. Essentiality and toxicity in copper health risk assessment: Overview, update and regulatory considerations. J Toxicol Environ Health A 2010;73:114-27. Harvey LJ, McArdle HJ. Biomarkers of copper status: A brief update. Br J Nutr 2008;99 Suppl 3:S10-3. Agency for Toxic Substances and Disease Registry. Toxicological Profile for Copper, Centers for Disease Control. Atlanta, GA: Division of Toxicology; 2002. Tchounwou PB, Newsome C, Williams J, Glass K. Copper-induced cytotoxicity and transcriptional activation of stress genes in human liver carcinoma (HepG (2)) cells. Met Ions Biol Med 2008;10:285-90. Chang LW, Magos L, Suzuki T, editors. Toxicology of Metals. Boca Raton, Florida, USA: CRC Press; 1996. Medicines and Healthcare products Regulatory Agency. Strontium Ranelate: Cardiovascular Risk – Restricted Indication and New Monitoring Requirements. United Kingdom: European Medicines Agency; 2014. Emsley J. Manganese. Nature's Building Blocks: An A-Z Guide to the Elements. Oxford, UK: Oxford University Press; 2001. p. 249-53. Avila SD, Puntel LR, Aschner M. Manganese in health and disease. In: Astrid S, Helmut S, Sigel RK, editors. Interrelations between Essential Metal Ions and Human Diseases, Metal Ions in Life Sciences. Vol. 13. Basel, Switzerland: Springer; 2013. p. 199-227. Wang S, Shi X. Molecular mechanisms of metal toxicity and carcinogenesis. Mol Cell Biochem 2001;222:3-9. Beyersmann D, Hartwig A. Carcinogenic metal compounds: Recent insight into molecular and cellular mechanisms. Arch Toxicol 2008;82:493-512. Yedjou CG, Tchounwou PB. Oxidative stress in human leukemia (HL-60), human liver carcinoma (HepG2), and human (JURKAT-T) cells exposed to arsenic trioxide. Met Ions Biol Med 2006;9:298-303. Yedjou CG, Tchounwou PB. In vitro cytotoxic and genotoxic effects of arsenic trioxide on human leukemia (HL-60) cells using the MTT and alkaline single cell gel electrophoresis (Comet) assays. Mol Cell Biochem 2007;301:123-30. Tchounwou PB, Centeno JA, Patlolla AK. Arsenic toxicity, mutagenesis, and carcinogenesis – A health risk assessment and management approach. Mol Cell Biochem 2004;255:47-55. Tchounwou PB, Ishaque AB, Schneider J. Cytotoxicity and transcriptional activation of stress genes in human liver carcinoma cells (HepG2) exposed to cadmium chloride. Mol Cell Biochem 2001;222:21-8. Patlolla AK, Barnes C, Hackett D, Tchounwou PB. Potassium dichromate induced cytotoxicity, genotoxicity and oxidative stress in human liver carcinoma (HepG2) cells. Int J Environ Res Public Health 2009;6:643-53. Patlolla AK, Barnes C, Yedjou C, Velma VR, Tchounwou PB. Oxidative stress, DNA damage, and antioxidant enzyme activity induced by hexavalent chromium in Sprague-Dawley rats. Environ Toxicol 2009;24:66-73. Yedjou CG, Tchounwou PB. N-acetyl-l-cysteine affords protection against lead-induced cytotoxicity and oxidative stress in human liver carcinoma (HepG2) cells. Int J Environ Res Public Health 2007;4:132-7. Tchounwou PB, Yedjou CG, Foxx DN, Ishaque AB, Shen E. Lead-induced cytotoxicity and transcriptional activation of stress genes in human liver carcinoma (HepG2) cells. Mol Cell Biochem 2004;255:161-70.